The showroom is no longer maintained, we've got a nice new online store instead now. Please click the link below to visit it, or use the main navigation menu. This is how most online purchased bikes arrive. Could you put this together? Safely? Some think they can, but most can't. Modern bikes are high-tech feats of engineering. They don't need a rocket scientist to put together, but they do need a competent mechanic with the right tools. 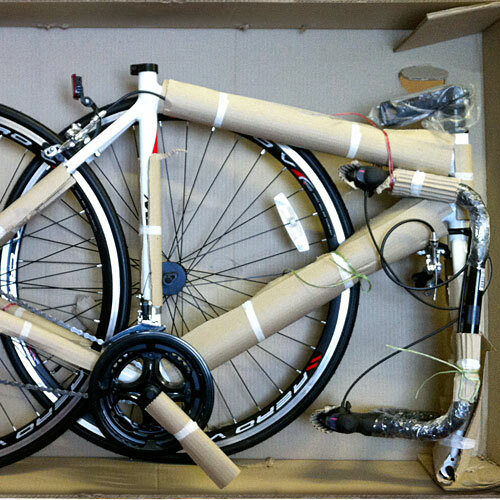 This is why we don't send bikes mail order, and why we don't think you should buy one that way either. When you buy in-store from us you know you'll be getting the right bike for your needs, in the correct size and that it'll be setup correctly and safely. We'll also give it a free tune after a few rides, and look after it for on you an ongoing basis, so you know it's always at it's best.